Develop completely native apps for macOS, Windows and Linux. The fastest way to build native apps. Cross-platform development is hard with traditional tools. Using Xojo, cross-platform apps are simple to create. In fact, Xojo can create desktop apps for Windows, macOS and Linux. Creating your apps user interface is fast, easy and fun with Xojo's visual interface builder. The Xojo language is easy to learn but also supports powerful object-oriented features that experienced developers will love. Become a desktop developer today. Xojo has been helping people create extraordinary apps since 1998. Save development time with Xojo by sharing code between platforms to have native versions of your app where you need it. We like Xojo so much that we even wrote Xojo in Xojo. This means it is cross-platform, so you can build for any platform from any platform. We like to make things easy. Use drag and drop to easily design your user interface and write your code using Xojo's powerful code editor with auto-complete. Xojo abstracts you from complex OS details and APIs, allowing you to create apps for multiple OS’s without extra work. 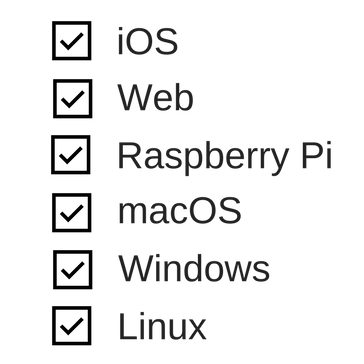 Xojo isn't just for macOS, Windows and Linux - develop mobile, web and Raspberry Pi apps the same way you develop desktop apps.